I was dying to use a recently acquired piece of spalted maple (Acer spp), but rather than doing the obvious thing and utilising it for box lids I elected to use for a cabinet front, and as I happened to have enough material for two I decided to build two small cabinets at the same time. After sketching a design I found that the panel width of 115mm was a bit too narrow, so rather than bookmatch the maple, which would not have suited the pattern, I decided to leave a 15mm gap each side, in the manner of James Krenov. I opted for brown oak (Quercus robur) for the rest of the cabinet because it would tone well and provide a good background for the wildly spalted maple. 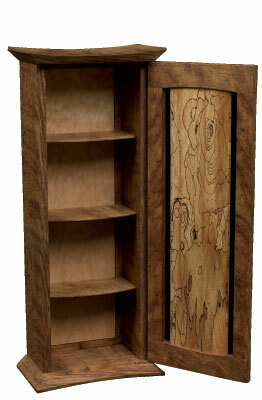 In recent pieces I have used bandsawn veneers for the carcass and doors, but chose solid wood for this cabinet. By using quarter-sawn stock the seasonal movement of the wood is cut down by 50% and the possibility of cupping greatly reduced. 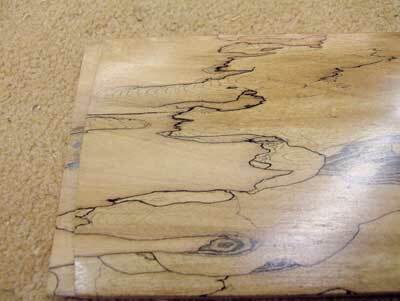 Quarter-sawn oak also shows off its attractive mudullary rays. As most of the pieces were re-sawn from the 2in board, photo 2, all components were left oversize and stood on edge for a week to allow any movement to take place before being planed and thicknessed to final dimension. Although the design and construction was simple, interest was added by the subtle use of curves. The top and base have a gentle curve across their width, the panel is curved to each side and the rails are slightly curved on the inside, with the panel curved to match. The shelves feature a curved double chamfer on the front edge. Small touches I know, but together they add up to make the cabinet come alive. 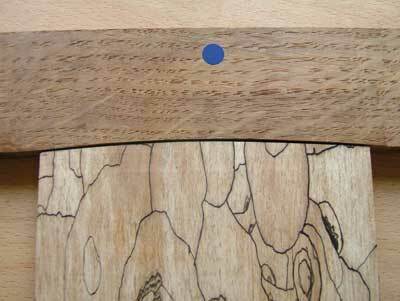 The curves for the top and base are marked to give a 5mm deviation and then rough-cut on the bandsaw, photo 3. Next, they are smoothed, in my case with the excellent HNT Gordon curved spokeshave, photo 4, and finally sanded with a block made from an offcut, photo 5. Having completed the curve the overall feel of each component was too chunky so I removed 8mm from the flat side with the bandsaw and this looked much better. I always evaluate the design as the making develops and make any adjustments, rather than sticking to the rigid predetermined dimensions. The door is jointed with mortises and tenons which, as with through dovetails, leave no margin for error on either component. 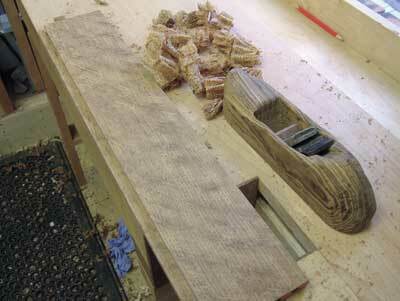 Using trial pieces, which were dimensioned at the same time, the final fit is established and bandsawn. Final adjustment is made by adding a piece of paper against the fence; this is much easier than trying to move the fence the last smidgen. The stiles are made 2mm thinner on the front face, adding another small, interesting detail. 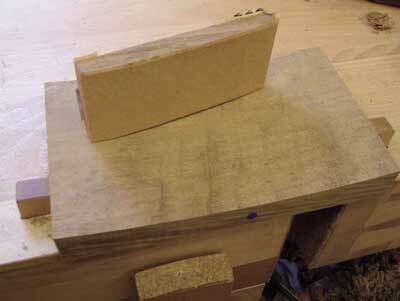 Because a reference face for one of the tenon cheeks would otherwise be lost, this is planed after all the joints are cut, photo 6. The panel slots are routed on the top and bottom rails using a router table and stops are carefully positioned to achieve an accurate and centred fit, photo 7. Gentle curves are then marked and cut with a spokeshave, taking great care to go up to, but not beyond, the joint lines, photos 8 & 9. 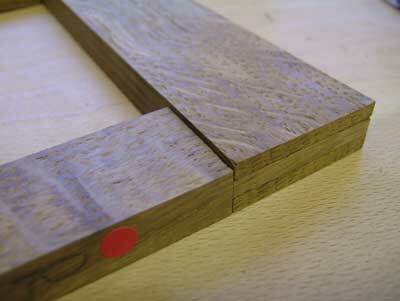 Tenons are routed straight across the panel ends to a tight fit, photo 10. The frame can now be assembled and adjusted to 90 degrees before being placed over the centred panel for marking the corresponding curves. 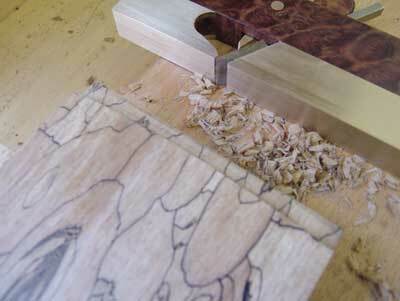 These are then trimmed carefully down to the pencil lines with a sharp shoulder plane. A 1mm gap is left at each end to cope with seasonal timber movement. 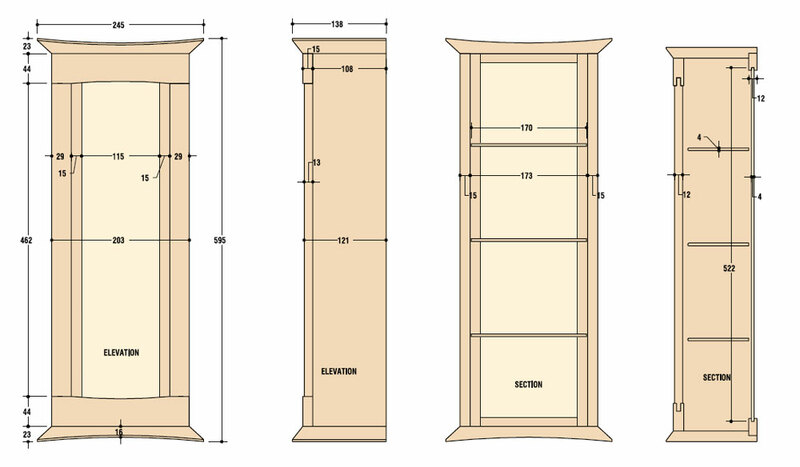 The panel is hand planed to a curve which drops 6mm to each side, achieved by bevelling each side to a 20 degrees angle close to the line and then connecting the bevel to the centre line with a faired curve. I deliberately left the middle part flatter than the edges to add more depth to the shape. The panel is finished straight from the plane, adding light reflection as well as tactile appeal. 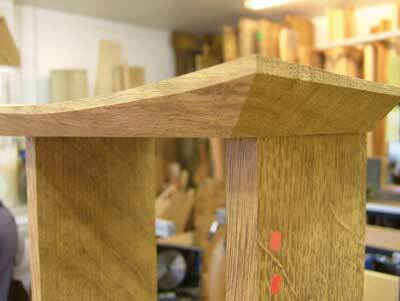 The sides are joined to the top and base with dowels using the excellent Joint Genie, photo 12. Taking the time to screw it in place before drilling is well worth the extra effort as this ensures that the jig stays put. The screw holes are finished in the hidden joint. 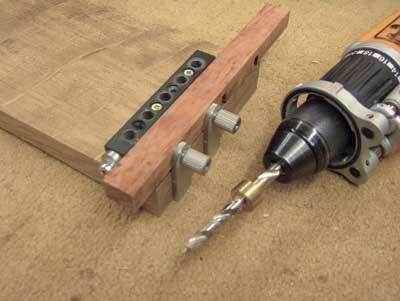 Use of a spacer creates the desired offset on the top and bottom and is removed when drilling holes in the sides. Start the shaping of the top and base on the tablesaw with the blade tilted to 30 degrees, photo 13, and taking care to leave an even edge at both ends; this is matched at the lowest part of the curved front, a job which requires careful shaping with a block plane to ensure an evenly spaced edge all the way round, photo 14. 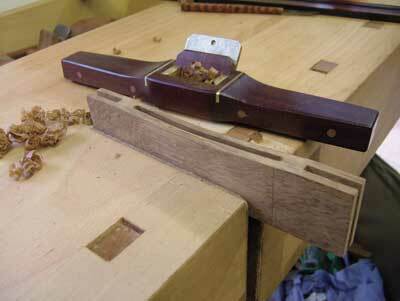 The block plane must be rolled during each stroke to avoid removing material from the flat front, this technique resulting in a very subtle compound curve. The back panel involves simple frame-and-panel construction using through mortise and tenons with a solid back of quilted maple. The panels are centred by matching a straight line drawn through the middle of the crown-cut ridges, with centre lines on the rails, photo 15. This was a little wasteful, although preferable to a misaligned grain pattern, which would have stood out badly. Dry-assemble the cabinet - with under-sized dowels - and plane any protrusion on the rear edges exactly flush; any deviation here would have been repeated on the inside, leaving an unsightly gap. Next, cut on the router table the rebate which receives the back panel. The stop cuts on the top and bottom are finished off and squared up with a sharp chisel, again with the cabinet dry-assembled. 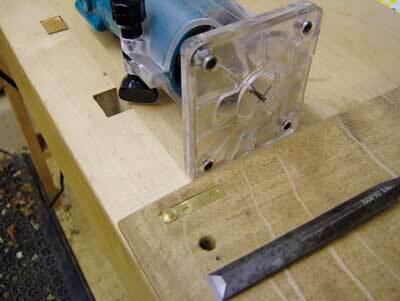 Trim the back panel to size to achieve a square fit and screw it in place with six countersunk screws. I like to locate the screw holes before trimming the door to size as doing it afterwards may introduce a slight deviation which could cause misalignment of the door. The door reveals are just 0.5mm. With the cabinet still dry-assembled, mark out the door hinge mortises in the carcass; to keep things square, use a thin spacer spanning both sides of the cabinet. 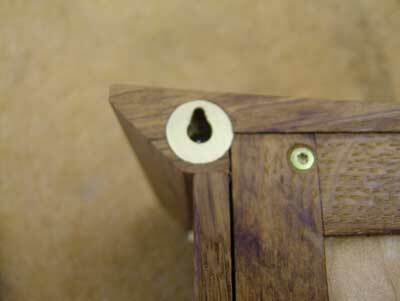 The same spacer, with a fence glued onto it, is used to mark the hinge position on the doors. 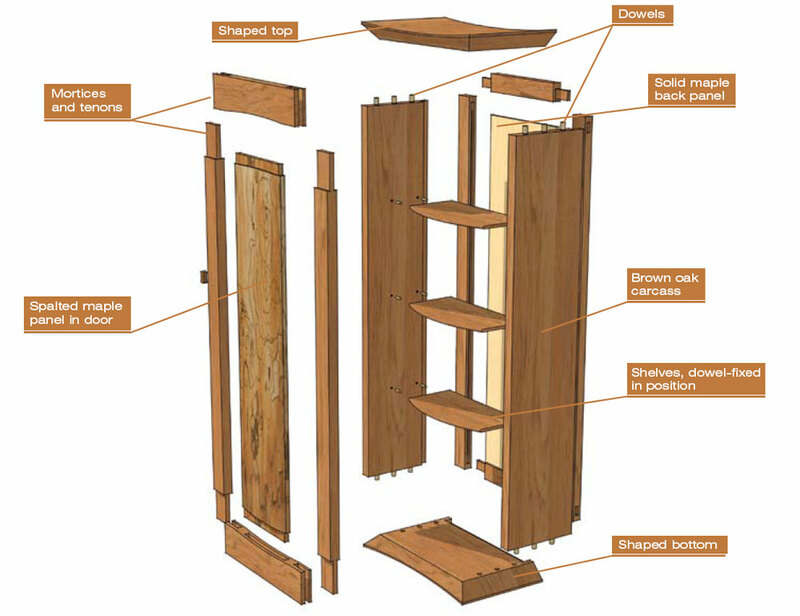 To ensure a very close fit, this does not make any allowances between the door and the cabinet side. If the door binds on the dry fit, the side - not the door - can be trimmed to a perfect fit. Usually this is not necessary although I did have a bit of trimming on this cabinet. 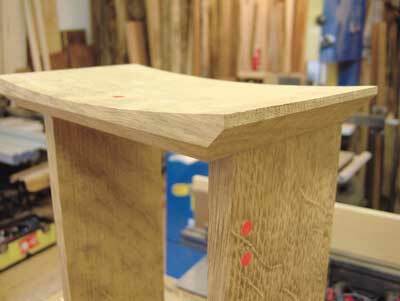 The mortises are roughed out with a laminate trimmer and finished with a sharp chisel, photo 16. 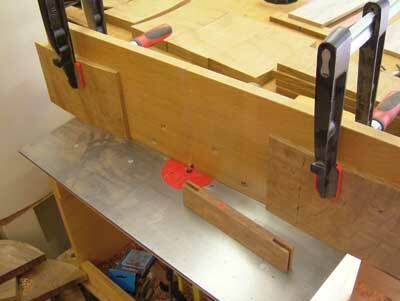 The cabinet sides are hand planed to a finish, photo 16, and the edges all eased with a small block plane. The shelf supports are drilled prior to assembly. I decided not to offer an adjustment to the shelf height as there was an optimum aesthetical position for the shelves which could be seen through the gaps in the door. The supports are just small pieces of 3mm brass rod, in keeping with the small scale of the piece. The shelves are made from 4mm-thick quarter-sawn brown oak and have a curved front with a double-bevelled edge to further enhance the feeling of lightness. 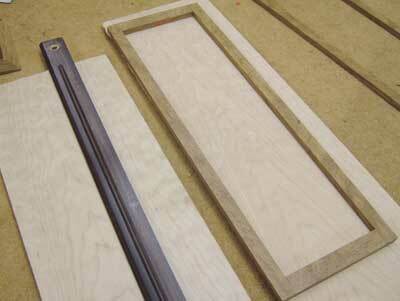 Check one last time that everything goes together, by dry-fitting with trimmed dowels. For absolute rigidity I decided to glue up with epoxy resin rather than yellow glue. 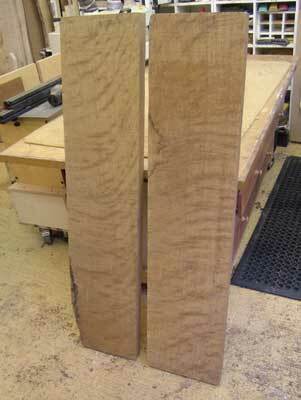 Also, the expansion of the dowels with a water-based glue may have caused some bulging in the thin carcass sides. With the carcass and door assembled, the back is screwed in place using previously drilled holes. 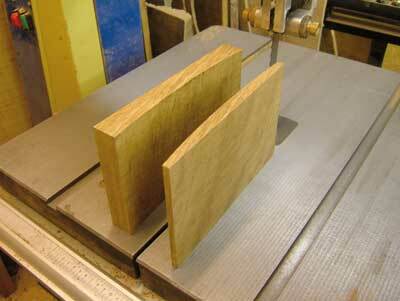 To create the correct clamping alignment, use the curved offcuts from the top and base. 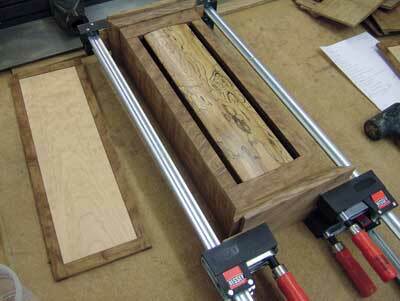 Adjust the clamps, photo 18, until the door reveals are even then leave the assembly to cure for at least 24 hours. I used two keyhole hangers at the top of the cabinet to provide an invisible hanging method, photo 19. These were made from 3mm-thick brass sheet and ended up about 11mm in diameter. They were recessed into the cabinet with an appropriately sized Forstner bit. The tiny handle is carved from bog oak and has two 3mm brass pins inserted into the back before shaping. Both the keyhole hangers and door handle are glued in place with epoxy resin. 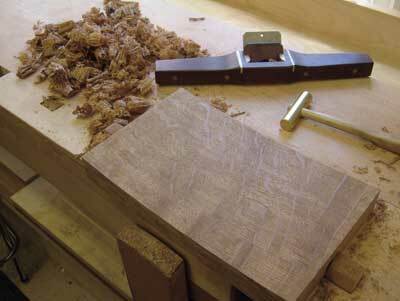 The only sandpaper used on this piece was on the curves of the top and base, the rest coming straight from the tool. All the finishing was done before assembly, taking care not to compromise the gluing surfaces. The brown oak received two coats of School House Wax, which left a matt surface, whilst the back and door panels received five coats of thinned shellac, followed by wax applied with synthetic pad. This left a soft sheen which contrasted attractively with the brown oak. I was pleased with this cabinet and felt I had done justice to the unique spalted maple. One of them sits proudly on the wall of our lounge diner and the other is for sale for Â£675. "All the finishing was done before assembly, taking care not to compromise the gluing surfaces"
The washer on the Brusso knife hinge was too big for the desired reveal so the hinges were slightly recessed into the cabinet. I have since located some smaller, high-quality knife hinges from Sanderson Hinges which are more suitable for smaller cabinets and come with different-sized washers and extra screws - very thoughtful!